Richardson Garden Runaway Bay Gold Coast in 2009 ….. 16 years on from when the garden was built. Hi, my name is Ken Aitken and this website is a compilation of my personal experiences, philosophy, design work, history, stories and everything in between. I would like to share with you through these few words, photographs and hyperlinked websites, a 3 Dimensional experience as though you were actually there with us. I sustained a brain injury in 1995 and I have learned to be a Brain Injury Thriver, rather than a Brain Injury Survivor. I learnt from that experience that life should be lived with hope, anticipation and a love of life. Life is AWESOME in every way no matter what happens to you!! We love people and we believe YOU are an awesome person ….. we think the best of you ….. we want to bring you into a new sense of belonging ….. no matter who you are …. what you look like, how you dress, where you live around the world, what you believe in and how you act that out to the rest of the world. We believe that everyone should be approached not for what you can get from them but what you can impart into their lives for good in an inner sense. We are here for one another …… I have a component of life that you need and you have a component of life that I need. I call this principle the Sustainable Life and I would like to show you a new sense of belonging and an understanding of an affirmation of identity. This is discussed in more detail at this post 5. PRINCIPLES OF LIFE: THE SUSTAINABLE LIFE for a Life of Wholeness. My wife Harriet and I, also both love to travel and I have documented our trips between 2003- present as a travel blog. We love to to see new and often spectacular scenery and geography and each place’s history and it is very profound to us. We love to meet new people in their cultural settings and you realise there are millions of others around the world who live their lives in quite often new ways.People express their ideas on life in the way they build and arrange their living spaces. It is a bit hard to go back to 79 A.D. when Pompeii as a thriving Roman city and was buried with so little warning by 5-6 metre of volcanic ash from Mt. Vesuvius. Pompeii was literally frozen in time. I would love to hear from you if anything in this website has inspired or interested you. If you would like to connect you can contact me below. P.S. Suggestions on reading this website: Click on any photograph and it should enlarge to a different size ….. at least half screen or size full screen. It will be clearer in detail than the photo on the post. It will be as if you were really there looking at the actual scene. You are an arm chair traveller with us. 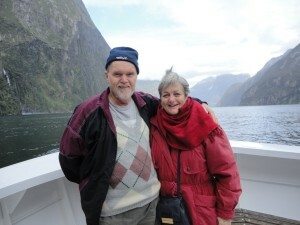 Ken and Harriet on their May 2010 holiday trip to the South Island of New Zealand. This is the Milford Sound section of their trip.